This 12' x 24' layout is our largest to date! Scott, Ray M, Nathan, Ley, Chris and Adam all helped to create this double-tracked display. The many features of this layout include: an alien ship and army bunker, many Regina landmarks, angled and raised tracks, over six feet of bridges, a motorized container stacker, and much much more! 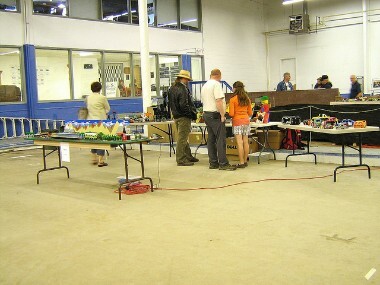 Ray J joined as well with some large-scale vehicles to compliment Ray M's remote controlled cars! Nathan and Ley designed this show with a train layout as well as some other LEGO creations. The train table combines a Western theme on one side with a modern theme on the other. Themes on the creation tables included Space/Fantasy, art and, automotive. Our second layout in Moose Jaw was designed by Chris, Ray, Scott and Adam. The cityscape included an airport, radio station, suspended bridge and a working Power Functions crane. Two tracks were used with a 9 volt track encirling the tables while a Power Functions train ran along the inside. 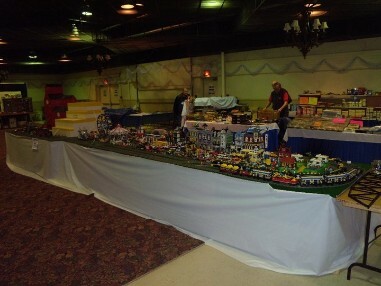 Andre and Linda put together this display for the show in Saskatoon. The display contains multiple tracks that run the entire length of the layout and showcase a number of styles of LEGO trains. The town set-up of Modular Buildings tower over humourous scenes and vehicles galore. A couple of large-scale building round out this massive display.